The Cherbourg trophies have remained ‘…not awarded’ on many occasions – too much wind to run the race or so little that the only option for un gout de la belle France was for the entire fleet to resort to the donk. This year was different with a possible sailable forecast for the southbound leg on Saturday, a generous TL of 0200hrs + a 3hr extension. To try and guarantee results in each class, the 14 entries were invited to take their times at 3 intermediate lines of latitude on the basis that whoever got furthest fastest would win their class. Kites up through the line then slight divergences according to anticipated speeds; who would arrive before the west going tide on the French side; how long would the forecast mid afternoon light patch last; and when would the following southwesterly kick in. Some clever tactician may claim to know all these variables in advance but mere mortals in PYRA make a best guess and set a course to cover different scenarios. On Shebeen we held the kite for just over three hours as the breeze slowly built from 10 to 15 knots. When it rose to 18 knots and clocking, we dropped and hardened up, hoping to bear away again when the lull arrived. Through the westbound shipping lane with flexibility to pass twice behind ships then rehoist in what was then only 8kts from ENE. 2 hours later the wind was still light and heading us. By now we were heading for Alderney so drop again as the wind went SE then S and horribly light (for us) at 7kts. Slow progress as the breeze clocked further round to SW with the ETA looking very late and fully anticipating sticking out for that 0200/0500 TL. The light westerly encouraged a rehoist at 1730 but very slow progress as it finally reached a NW 5kts. Main down to let the kite breathe freely which worked well. 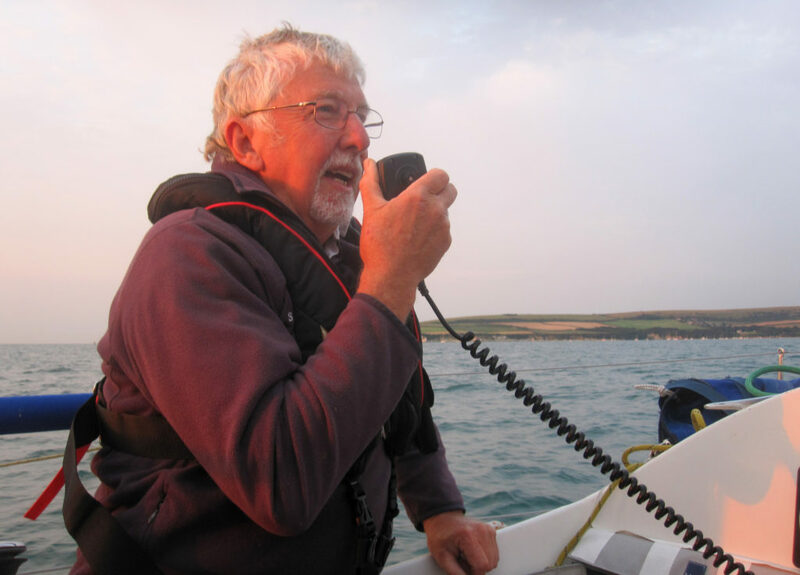 A funny 5 minutes at 1900hrs as the windex rotated round and round but by 1930 we were close hauled in SW 9kts and just laying the entrance but no other PYRA boats in sight so humiliation seemed certain. Little did we know! 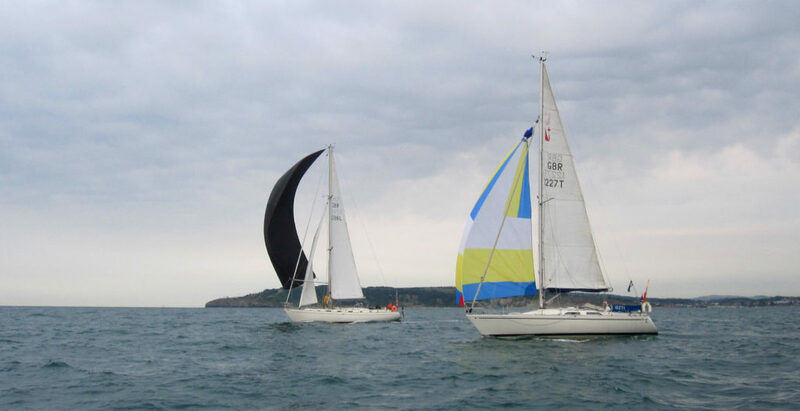 Meanwhile the class 1 fleet had been having a wretched time, parked windless for 3 hours from about 1700hrs in and around the Grand Rade within sight of the finish! Amethyst retired to make their restaurant booking unaware that they were well in the lead. The Grey Silkie retired after just a short period of drifting around. Deity threw the towel in as they drifted hopelessly westwards away from the line. Destiny and Addiction both stuck it out coming 1st and 2nd in class respectively. In class 2 Maris Otter was the only boat to make the whole distance, but only because as they drifted under slatting sails, skipper Rose Debenham cunningly bolstered her young crew’s resolve by reading them 6 full pages of her late father’s memoirs recounting a much longer windless patch in the AZAB. It worked! They won class and overall by 31 seconds (ahead of class 3 Shebeen). Yes, for once this was a small boat race with only 2 minutes separating Shebeen and Zorra. The third class 3 boat , Skykomish, showed admirable resolve arriving well into the night. 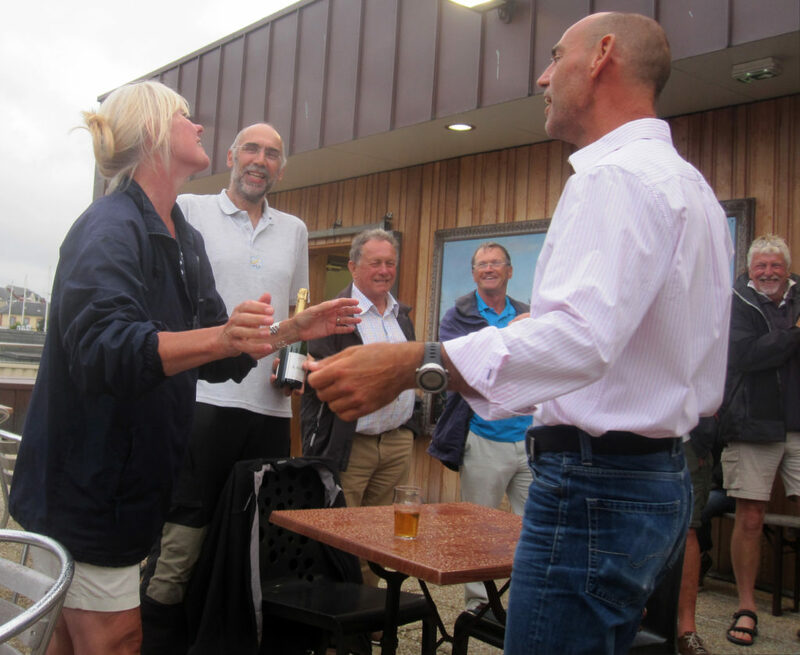 Similarly Nellirose stuck it out finishing close to midnight snatching class 4 honours away from Ceres who had made 2 of the intermediate latitudes before motoring. 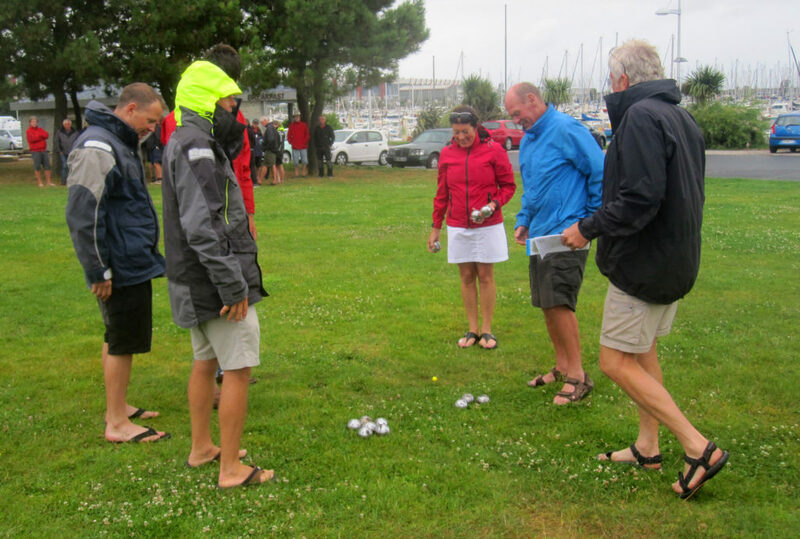 A breezy damp Sunday in Cherbourg did not deter a good turnout for the annual PYRA International Boules championship, won in record time (no hanging about in that driving drizzle) by Blue Extasy, followed by the RV at Cherbourg YC generously hosted by Morgan Carey Architects with drinks and bottle prizes. For the race home on Monday a modest NW breeze was forecast, possibly with a westerly spell after lunch, but certainly enough to dispense with shortening options en route. Blue Extasy gate started all classes together at 0710 with a beat along the Grand Rade likely to be followed by a close fetch across the channel. 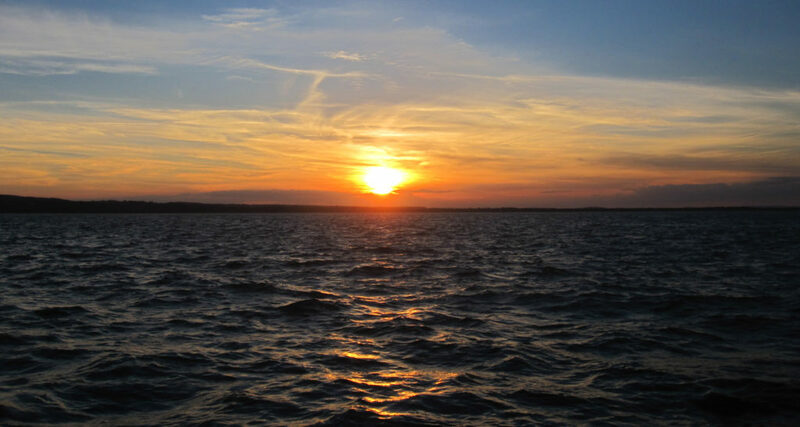 A west going tide would predominate so the later tide change would only affect the slowest. There was too much north in the wind to lay Poole in one, unless the possible westerly shift would materialise to give a lift homewards. Surprisingly boats starting peeling off westwards soon into the race, obviously sceptical about any backing of the wind. We held on till the strongest part of the tide then tacked and shot off westwards to get the fastest possible lift to windward. Amethyst held on and did manage to lay Poole in one go. Zorra, being much slower was less lucky. She stood on but rather than a lift, found a whopping great hole (which subsequent data showed extending over a large part of the central Channel) forcing her to eventually retire and motor home. 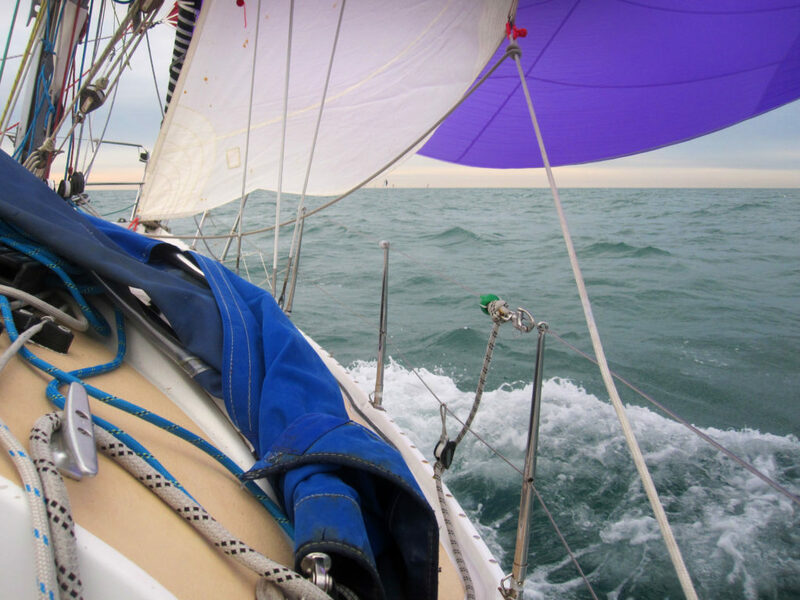 We were oblivious of this, again on port tack but soon enjoying the forecast westerly. One part of me was cursing for having wasted time on the westward hitch; the other part revelling in what turned out to be a sizzling tight kite reach only reverting to genny for the last 9 miles or so to the finish. As it happened, we had retired anyway due to being 5 seconds late over the line after the Pathfinder had tacked. We thought we were ok but Zorra challenged us and rules is rules dammit. So, apart from that little spat in class 3, all the rest finished. Amethyst took 1st place in class 1, Maris Otter took class 2 whilst Skykomish and Nellirose both came in late to take classes 3 and 4 respectively. 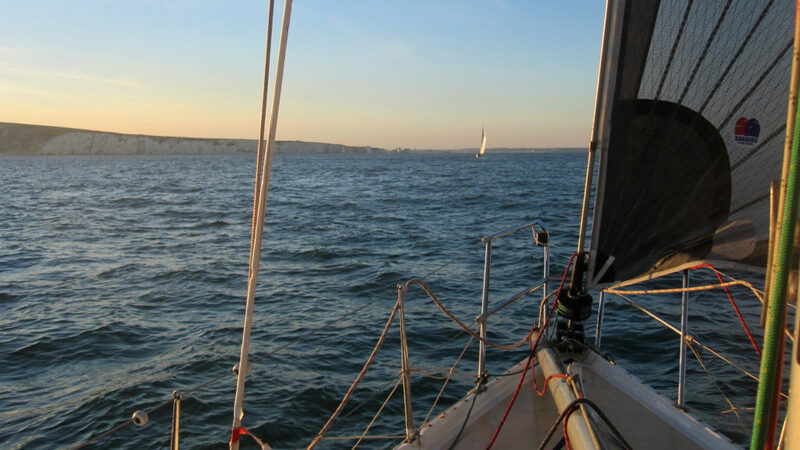 The channel races are fun and often tactically challenging; very different from the along shore races where the competition is always in sight. We need more of them….away and into the blue yonder.